Feeling anxious because your friends are expected in half an hour and you still have to prepare the dinner? No problem - relax - just turn on your laptop and you can peruse a menu, click the dishes you want, and a pre-programmed robot chef will start to cook spicy chicken, stewed pork, or boiled noodles. This is not a sci-fi movie, it's real life at the Huilongguan home kitchen of Liu Changfa. A retired professor specializing in automation, Liu first became involved with robots in the 1980s at the Chinese Academy of Sciences. were doing research on industrial robots, such as giant robotic arms for automobile factories. However, since retiring his passion for machinery has taken him one step further and he has invented a robot to make cooking easier. 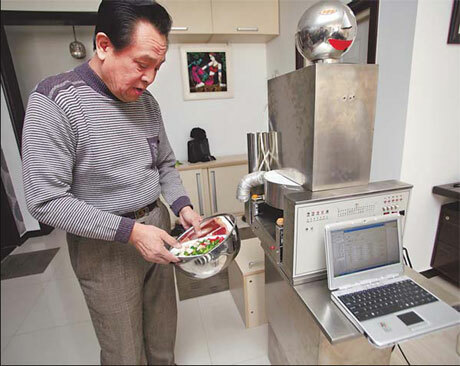 The robotic chef idea popped up when he injured his leg in 2005 after Spring Festival. Liu fell and broke his leg when he had a stroke. he had to stay in bed and rely on his wife to do all the housework. burden with my wife," he said. "Of all the housework, cooking is the most tiring. So I began with the idea of the robot chef." chef finally came into being in June 2006. Spicy chicken cooked and served by the robot chef. the robot with menu programs and software detailing cooking methods. Soon the robot was able to cook around 200 dishes. The latest incarnation, Robot No 3, is tailor-made for restaurants. "This is the one I am most proud of," Liu said. Robot No 3 is a 1.5-meter-high, stainless steel humanoid with a stainless-steel ball for a head. His stomach is an electric oven with a mechanic claw on top, while five tubes containing vinegar, soy sauce, and other seasonings are installed behind his back. With just a click of a button, the robot starts work with a clear human voice: "I am Robot No 3. And I am now ready to serve you. Please put the pot inside." What you do is put all the raw vegetables and meats in a pot and put that pot into his stomach. After you click the dish on the connected laptop, the pre-programmed robot will take care of the rest, the sensors responding at the appropriate moment to add seasonings and water. The cooking programs were based on menus designed by chefs from a renowned restaurant in Beijing. Robot No 3 is programmed to add sauce to the dishes whenever necessary. "It will not put all sauce in the pot and stir, Chinese food is not like that," Liu said. The robot informs you when the dish is ready. Liu Hexiang, a 9-year-old boy who lives next door to Liu, was among the first group of people to try the robot. He borrowed the robot to cook for his friends. "The children were amazed, and said 'It's so cool'," Chen Fang, Liu's mother recalled. Restaurant owners are also starting to show interest. According to Liu, a robot restaurant is expected to open later this year. He has already signed a contract with one restaurant owner and they are seeking the right location. The World Trade Centre area in the east of the city is their preferred option. "The benefits of using these robot chefs are obvious," Liu said. "Aside from the accuracy of timing and the consistency in taste, the robot chefs will work 24 hours a day without complaints and they don't need a salary."